Laing at Daing, Laing with Dried Fish. I love my laing cooked with dried fish. Both taro leaves and dried fish are best cooked with coconut milk. With this combination I could consume several serving of rice. Cooking is as simple as my previous post of laing, except for the addition of ginger and onion, I simmered my coconut milk together with the aromatic ingredients and bagoong alamang before adding the taro leaves. The gabi leaves are simmered at low heat with out disturbing or stirring for the first 20 minutes. To wash off the salt and lessen the saltiness of the dried fish it should be soaked for at least 15 minutes or more. For this recipe I used a meaty dried labahita fish but any dried fish will do, however I recommend a meaty dried fish. Here is the recipe. Rinse dried gabi leaves and drain, keep aside. In a large casserole pour in the coconut milk, add bagoong alamang, ginger, garlic and onion. Bring to a boil, stirring continuously, simmer for 2-3 minutes or until the mixture has slightly thicken. 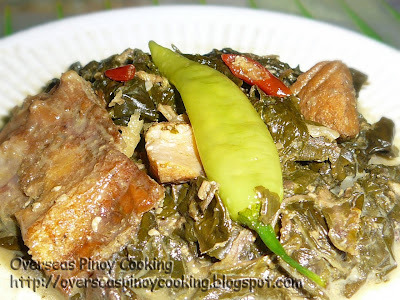 Add in the gabi leaves and on top put the dried fish, green sili, siling labuyo and coarsely ground pepper. Simmer for 15-20 minutes at low to medium heat. Do not stir for the first 10 minutes, using the ladle just press down the gabi leaves to prevent from mashing, when the gabi leaves are cooked and most of the liquid has evaporated add in the kakang gata and cook for another 3-5 minutes, season with salt to taste if required. Serve with a lot of rice.